Audra Holden and create a community story for the Organicfest Celebration to present to a local, do-good non-profit. When a community works together to create something of beauty it shows the beauty of the community. Each person's gift enhances the beauty of everyone else's. We are all interconnected within the many communities to which we belong – our families; our school or work communities; our interest group communities, and our city, state, country, and world communities. Each community has a set of values that defines it, and every member makes choices based on those values. These values are like the warp threads, the vertical threads, of a tapestry. How the choices each of us makes touches on those values, like the weft threads running across that may or may not touch each of the warp threads, determines the beauty and integrity of the fabric. How do the choices we make, all of us that gather at Organicfest, touch on our shared values? Whether you're an elder or a child, come to the Story Loom to add a bit of yourself to the tapestry that represents our community. You can bring something from your garden or something from your home to represent your gift to our community. Be creative. What color speaks of you? What message do you want to share? Do you have an old tee-shirt that carries your energy that could be cut up to weave into the warp? Bring it with you. We will also have materials on hand from which to choose. will be a gift to some lucky recipient at Organicfest celebration. 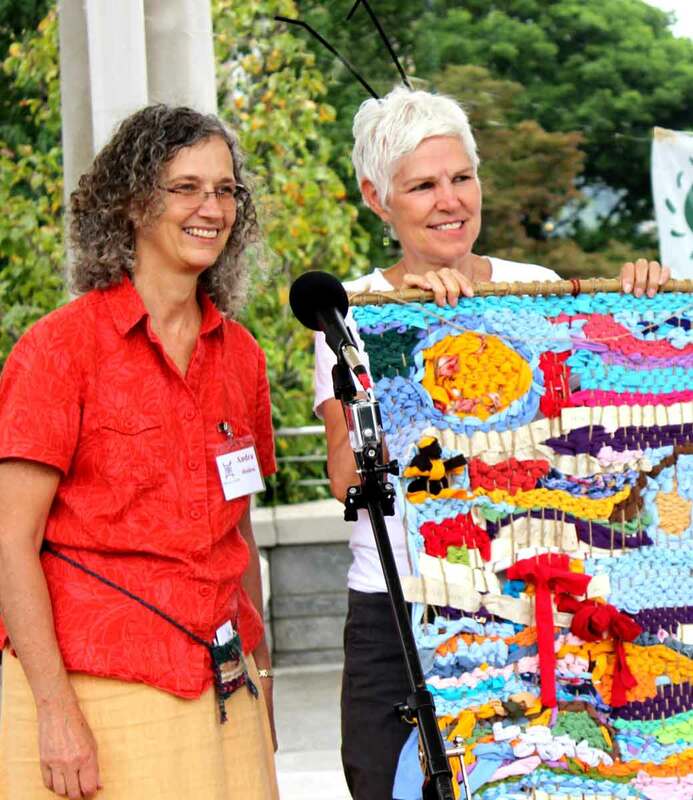 Audra Holden is a fiber artist in beautiful Asheville, North Carolina. At her retreats and workshops, weaving is used as a hands-on tool for personal introspection. 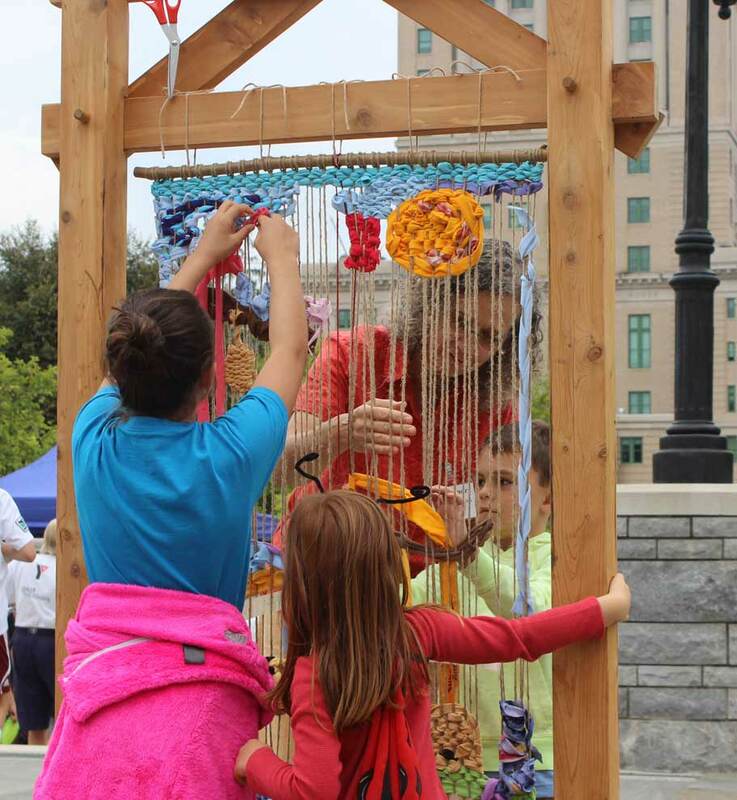 She is a teaching artist to Asheville area schools and is available for group weaving facilitation at public or private events. or look for her "Life on a Loom" Facebook page!